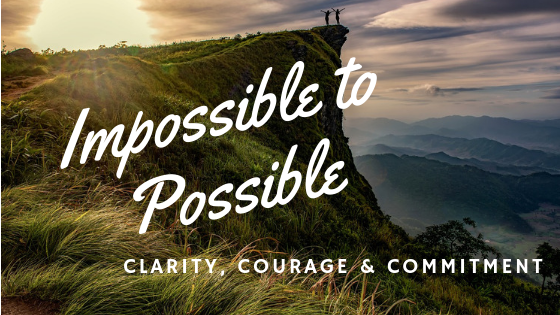 The rugged path between impossible and possible is navigated through clarity, courage and commitment. Each quality is essential! Our hot water heater sprung a serious leak. Four days without hot water is a minor inconvenience. However, when outside temperature dips to -40°, a steaming hot bath before bedtime is a luxury I appreciated. What made the difference? Both men were presented the same problem; both were experts in their trade. “Impossible” to one perhaps meant, “too much trouble!” “Possible” from the other displayed a willingness to overcome any obstacles. Many vivid accounts of men and women who overcame impossible obstacles are written within the bible. I think of Caleb one of 12 leaders Moses sent to spy out the promised land. “It can’t be done!” ten declared! Forty-five years later while the ten nay-sayers were cold in their desert graves, Caleb continued to believe, “With God’s help, I can“. “So here I am today, eighty-five years old! to battle now as I was then. Caleb remained willing to face the challenge head-on! Ominous giants could not prevent him from possessing God’s promise. We all have “hill country”, an impossibility larger than personal ability. The nature of the obstacle is unimportant! Problems can be polar opposites! Glass ceilings waiting to be broken, fragile mirages before omnipotent God! Sheri Fink reminded me recently clarity, courage and commitment are three essential ingredients necessary to accomplish victory. My past failures consistently resulted from a deficiency in at least one of these areas. Nay-sayers and critics abound in every generation. “It can’t be done,” the noisy entourage gloats! Jeering relentlessly as the brave press against an impossible situation! Caleb’s resistance came from his own “tribe”. Our greatest detractors may be those who are the nearest to our hearts. Mockers, with potential to stop us, ascend from the ranks of both friend and foe. Clarity is “being certain or definite“. To an artist clarity means “sharpness to the image or sound”. Clarity for the Christian comes from knowing God’s intention, hearing His voice, and perceiving His direction. It would be foolish for Caleb to face the military prowess of mighty mountain defenders without God’s direction. There is a palpable difference between truth and conviction — between fact and faith! That veritable mountain we face is insurmountable without God! Every person who stumbled in the bible, from Eve forward, doubted God. Each questioned and reasoned until faith dissolved into fragile unbelief before the very thing God meant them to overcome. Clarity, genuine unshakeable clarity, is to know the presence, power and word of God for our specific situation. Without clarity one will effortlessly fall into rhythm behind the fear mongers. Without clarity conquerors become quitters! “…Humanly speaking, it is impossible. Courage separated Caleb and the masses! A few fear-filled words turned believers into doubters, the brave into cowards! “Be careful little tongue what you say,” is more than a children’s chorus. Words carry the potential to destroy like wrecking balls or form building blocks! “We can’t … they are too strong … powerful … cities are fortified and very large … Anakites, Amalekites, Hittites, Jebusites, Amorites, Canaanites”. Panic raced through the entire camp causing hearts to faint and knees to tremble. Such courage germinates in the knowledge of God’s abiding presence. It flourishes in the shadow of the One who promises to never leave nor forsake us. Every overcomer rises above fear to “go up” in faith! I heard a story of a runner who intently prepared, conditioning body and mind, to run a marathon. He trained on a 26 mile course. After passing the 25 mile marker during his first marathon, he increased his pace pushing toward the finish line. The official length of a marathon is actually 26.2 miles. Miscalculating the distance, he started the sprint too soon and collapsed unconscious at the finish line. He was unprepared for the last .2 miles! Distance matters! It takes the tenacity of a marathon runner to face the impossible! It requires commitment to finish well! Even though Caleb heard the clear word from God through Moses, it still took commitment to claim his promise. His entire generation died in the wilderness. Were there times of doubt in the desert? Caleb endured seemingly endless wandering in the wasteland, survived plagues, judgements and wars. Yet, the promise echoed in his heart as clearly as the day it was spoken. Caleb refused to quit before he conquered! Forty five years of trusting, waiting, training, and persevering. Forty five years of commitment to God who is faithful. Caleb looked to the finish line; he ran the distance. With Caleb as our example, let’s remember God is bigger, stronger, and greater than any mountain standing in our way! May we choose to fix our eyes on Jesus! Acknowledge that “great crowd of witnesses” (Hebrews 12:1) cheering us on! Seeking the clarity needed from the Word of God, may we each take courage in His Presence, with commitment to conquer. “‘If you can’?” said Jesus. Whether the mountain is a difficult obstruction or a dream unfulfilled, let’s go for it! How many new songs will be song, books published, and missions accomplished if we do? God is ready to partner with you in your impossible, creating a place for Him to receive glory? Don’t quit! Conquer! Turn the impossible into possible! Nothing is Impossible – With God Your Problem is God’s Opportunity! I hold in my hands an amazing reminder that nothing is impossible with God. Our greatest obstacles can become stepping-stones of God’s opportunity in our lives. What is the hardest thing you have ever faced? Multiplying it by more than you could imagine gives an idea what refugees across the world face daily! My gift is a simple little mosaic tile with Arabic letter “n” (pronounced “noon”). “Noon” is the symbol Islamic militants used to mark Christian homes and businesses. It was the signal to “convert, pay a tax or be killed. Many Christians fled as their property was confiscated by ISIS. Yet this very symbol has become a source of solidarity, strength and perseverance. On the back of my tile is a name of the person who created it; a gentle reminder to pray for them and others. When God speaks all of creation stops and obeys! Nothing is impossible! Nothing! When we are hardly capable of keeping our heads above ground, it is difficult to remember; remembrance is a powerful tool giving strength to face obstacles head on. In remembering came salvation and a second chance to obey. for his compassions never fail“. The writer goes on to declare God’s faithfulness, declaring him as our Source and Sufficiency. The God who is more than enough. At one of his most critical moments, Joseph remembered the dreams God has given him and watched as they were fulfilled before his eyes. There is something very powerful about remembering what God has said and done; it ignites confidence for today and births hope for tomorrow. Thankfully, God has given us a book of remembrance – The Bible. I’ve never had to flee my home, part a sea, raise the dead, face lions, or fierce armies. Consistently though, obstacles I’m not sure I can endure, let alone overcome, are in my path. Several years ago, I was challenged to keep a journal. I struggled with it for a long time until Pastor Rod Barks showed me “S-O-A-P”: scripture, observation, application and prayer. This little guideline is exactly the structure I need to keep on track. prolonged deserts of the soul. With God nothing is impossible! My journal like the “noon” is a reminder of how big and crazy awesome my God is. My smallness doesn’t restrict Him; the world’s madness doesn’t hold Him down, keep Him back or restrain Him in any way. 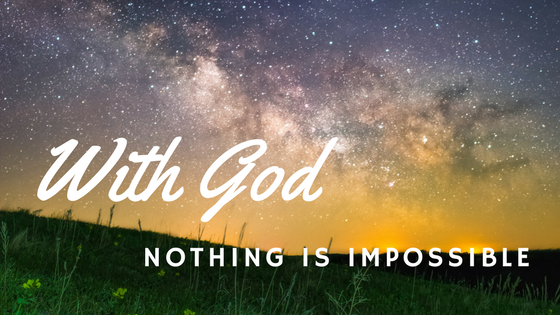 Nothing is impossible with God! ***SPECIAL THANKS: To Scott Aspinall Photography for the use of title photo! You are an amazing artist with you camera! Please take a moment to check out his work. Normal? What Does It Mean To Be Normal Christian?